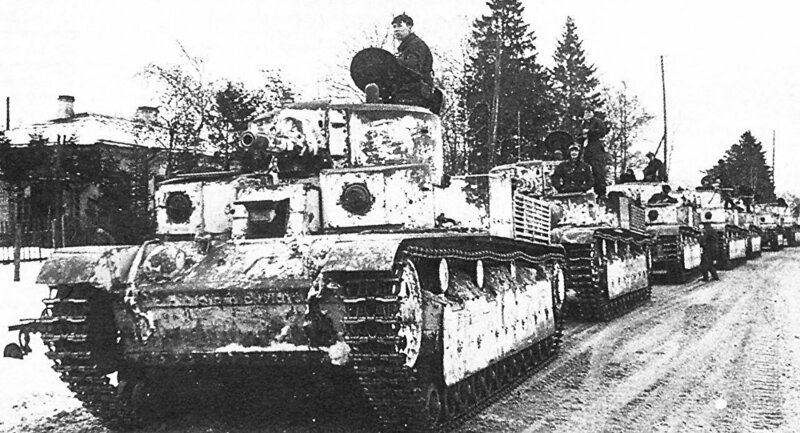 Military journalist Alexander Khrolenko looks back on the incredible story of how a lone Soviet T-28 medium tank conducted a daring raid on Nazi-occupied Minsk in the early weeks of the Great Patriotic War. On Sunday, Russia celebrates Tankers Day, the official holiday for tank crew established in 1946 in honor of the achievements of armored and mechanized forces in the Great Patriotic War. In light of the celebration, RIA Novosti contributor Alexander Khrolenko penned a piece about one of the most striking episodes of the tank crew heroics during the war: an incredible raid by a single Soviet T-28 crew on German-occupied Minsk in July 1941. In early July 1941, a T-28 medium tank commanded by Sargent Major Dmitri Malko was struck by a Luftwaffe raid as it made its retreat along with a column of other Soviet mechanized units near Berezino, about 90 km east of Minsk, which had been occupied by the Nazis soon after the start of the war. The tank's engine was damaged. Malko, an experienced mechanic, managed to repair it, but ended up hopelessly behind the rest of the column. Rather than try to catch up, the officer and his crew decided to head west and pay a visit to the Germans in Minsk. Stocking up on ammunition at an abandoned military warehouse, the T-28 headed west to the Belarusian capital. Field Marshal Hans Guderian's tank forces had already advanced east, and the lone Soviet T-28 driving along the roads did not attract much attention from the Germans, who were used to seeing trophy enemy armored vehicles. Making their way west, Malko's tankmen hit upon a column of German motorcyclists about 40 km outside Minsk at a bridge over the River Svislach. Khrolenko wrote: "The T-28 crashed into the column, shooting up enemy forces with its cannon and four machine guns. After that, the crew destroyed two German trucks, a Hanomag armored personnel carrier and dozens of troops in front of a distillery. Moving further into the city, the T-28 ran over and shot Nazi troops in the streets and in Gorky Park (which contained a military encampment)." "In the course of their raid on Minsk, the six Soviet tankmen destroyed or disabled about 10 enemy tanks and armored vehicles, 14 trucks, and three artillery batteries. German troops suffered heavy losses totaling about 360 soldiers and officers." The brave crew of the T-28 drove through central Minsk, firing until it ran out of ammo, before German command finally realized what was going on. A lone Wehrmacht anti-tank gun fired on the Soviet tank, but its frontal armor absorbed the blow, after which Major Vasechkin returned fire, destroying the gun. Khrolenko wrote that after their mission was complete, "the T-28 nearly managed to break out of the city, but on its outskirts, in the area of the Kalvariyskoe Cemetery, it got hit by flanking fire by enemy artillery and caught fire. The Red Army troops managed to escape the burning tank." The tank's crew would face differing fates. Tank driver Major Vasechkin left the tank through the commander's hatch, firing from his TT handgun before being shot down by the Nazis. Cadets Alexander Rachitsky and Sergei (surname unknown) were also killed in the battle. Cadet Nikolai Pedan was taken prisoner and held for four years in a Nazi concentration camp. He was eventually freed, reinstated in the army, and demobilized in 1946. Cadet Fyodor Naumov went into hiding, joining Belarus's powerful partisan movement. He was heavily wounded in 1943, and evacuated east. Sergeant Major Malko managed to escape Minsk and headed east, meeting up with Soviet troops. Khrolenko writes: "He fought in the tank troops for the rest of the war, his tank catching fire sixteen times…He met Victory Day in East Prussia, promoted by that time to deputy commander of a tank company. Exactly three years after the 1941 raid, on July 1944, Senior Lieutenant Malko found himself in liberated Minsk, and saw the burnt out husk of his T-28." "Later, in the spring of 1945, US counterintelligence interrogated German Major Rudolf Hale, who had been taken prisoner in the Ruhr area. During his interrogation, the major told the Americans that in the summer of 1941, his company and its equipment were almost completely destroyed after the unexpected appearance of a Soviet T-28 in Minsk. US command handed this testimony to the appropriate organs their Soviet counterparts. However, no one believed the stories of Tankman Dmitri Malko or German Major Rudolf Hale. Only in 1966, when Nikolai Pedan confirmed the story, would Malko be awarded the Order of the Patriotic War, 1st Class." — Дмитрий Бурдинов (@Byrdinov) 28 марта 2016 г.
Dmitry Ivanovich Malko, T-28 tank driver who destroyed over 300 enemy troops and 10 armored vehicles in occupied Minsk. Overshadowed by its younger cousin, the legendary T-34, the T-28 was one of the most formidable medium tanks in the world during the early war period. The steel monster had 80mm thick frontal armor, and 40mm side and rear armor. The tank's unusual multi-turret configuration included a 76mm cannon and four 7.62mm machine guns. The tank's cannon could penetrate armor up to 50 mm at distances up to 1,000 meters. Its 500hp engine allowed it to move at speeds of over 40 km/h, and successfully cross ditches, escarpments and other obstacles. The onboard radio station allowed for communications at a range of up to 60 km. The tank had a standard crew of six. In June 1941, the Red Army fielded about 250 serviceable T-28s. The last combat use of the T-28 would be reported in 1944.